Due to a last minute trip last weekend to see my brother before he leaves again for London, we kept our Super Bowl festivities to a minimum. While a big pot of tortellini soup simmered on the stove top, we sipped Guinness and snacked on hummus. Just the two of us. In our sweatpants. It was quite cozy, actually. The game was a good one — if you’re a Packers fan, that is. Nick is not. But he was a good sport. Note: This make a lot of hummus. We suggest halving it for two. And you will still have plenty of leftovers. In a food processor, combine chickpeas, tahini, olive oil, water, lemon juice, and cumin. Process until smooth. Add garlic, roasted red pepper, and sun-dried tomatoes. Process until pepper and tomatoes are finely chopped. Season with salt and pepper. Serve with pita bread and carrots. I thought this recipe was great. One of my biggest pet-peeves about hummus (besides the fact that almost nobody seems to know how to pronounce it) is that it is too dry, especially processed store-bought stuff. This was moist without being soupy, which is really nice, in particular, when you’re dealing with a flavor like roasted red peppers that I just don’t associate with drier foods. Nice recipe. Thank you so much for this recipe! 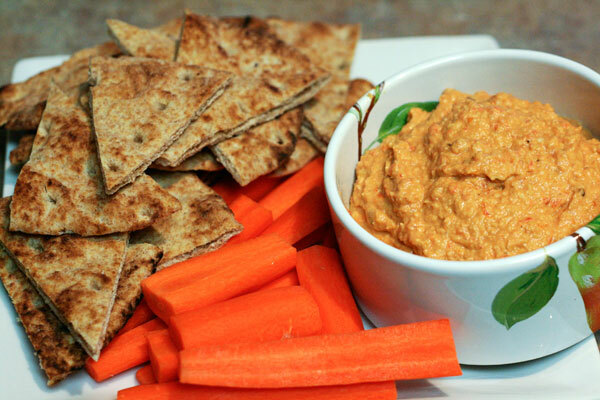 I love to make hummus and this is definitely the best recipe I’ve found! Love that it has both roasted red peppers and sundried tomatoes… Haven’t found that anywhere else!